We were disappointed when Polar sacrificed the GPS capabilities of the M400 smart sports watch so that its A300, revealed in early 2015, could hit the market with a cheaper price tag. But affordability is apparently no longer as important to the company as features, because Polar’s new M600 is a full-on Android Wear smartwatch. As far as fitness trackers go, the new $330 Polar M600 is priced well beyond what most consumers are now willing to pay for a step-tracking wearable. And while there are already plenty of smartwatches that incorporate heart rate tracking, Polar’s technology, which uses six LEDs and a custom-developed algorithm, has always been deemed one of the most accurate. So if you’re an avid runner who can’t be separated from their email inbox, the M600 might be the fitness-focused smartwatch you’ve been looking for. Like its predecessor, the M400, the Polar M600 boasts GPS tracking so you can map your route after an outing. And beneath its 1.3-inch touchscreen display you’ll find a dedicated button for accessing Polar’s proprietary performance tracking apps. But since the M600 runs Android Wear, there’s also hundreds of other fitness apps that can be downloaded to its 4GB of built-in storage. 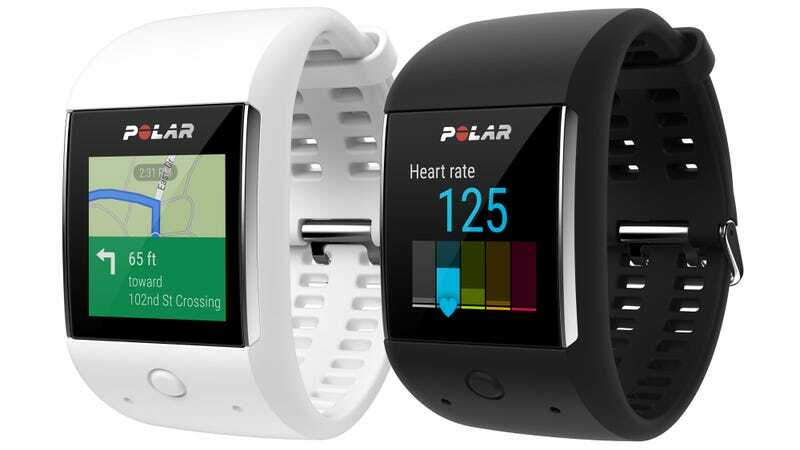 Availability is slated for sometime later this year, and if the white or black finishes aren’t doing it for you, Polar will also be selling swappable wrist bands so you can ensure the M600 matches your carefully selected Lululemon running gear.